Accommodation: Hotel Ambassador Resort Manali is situated on the divine land of Manali and accentuates its international style architecture and furnishing, keeping in mind to retain the local essence. 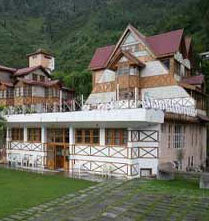 It has total 55 rooms that offers breathtaking vista of the surrounds, mountains, gardens, and forests. Moreover, these rooms are equipped most modern room amenities like satellite TV with channel music, telephones with international dialing, attached bathrooms with hot/cold shower, refrigerator, shaving mirrors, alarm clock, laundry, room service, bathrobes, bathroom sleepers, etc. Café Jardin: It is an English coffee shop which runs 24x7 and platters breakfast, mini lunches and thus become remarkable for family get-togethers. You will be amazed to see its architecture which is done stylishly by making huge glass windows and spacious balcony, which can really elevate your spirit to choose it there and then. Library Bar: It has a library bar that perfectly matches the mood of tourists in the middle of a small water body and two small waterfalls. The gentle sounds of water subdued lighting and a modern bar counter make this place a hot favorite amongst the lodgers. D' Jong: It is the one and only Tibetan Chinese specialty restaurant located in the beautiful vale. Its interior décor is dolled up with frescos and carved painting which is done on roofs, windows and doors. Bar-be-que: One can enjoy gala bar-be-ques which are mouth-watering temptations. Being the honorable guests of the hotel, you will be asked to check what special is brewing. However, the bonfire which is open high season is like an icing on the cake. Kibber: It is a brilliant North Frontier Cuisine that displays kitchenette and three tier seating and thus gets an image of huge fortress. Business Facilities: Hotel Ambassador Resort Manali has a spacious conference hall which is en suite with up-to-the-minute business supplies such as wi-fi with internet connection, projector, broadband, instant facsimile, photocopy machine, fax, courier, telegraph, 24-hrs secretarial assistance, travel desk, mobile on rent, etc. Recreational Facilities: Spectacular Spa and Jacuzzi, steam bath, sauna, squash court, badminton, adventure sports, billiards, table tennis room, card room, carom board, roller skating all weather rink, gymnasium, shopping arcade, fitness centre, bar, yoga, meditation, nature walk, local sightseeing trips, etc. are some really refreshing activities to cheer you up and feel re-energized from head to toe. Other Facilities: Front desk, doorkeeper, baby care facility, airport/railway station transfer, wheelchair on request, electronic safe, tour guide, ample car parking, personalized services, medical assistance, car rental service, shuttle service, travel and tour counter, money changer, fireguards, generator, acceptance of credit card, etc.